Written by Roger Caplin, August 2018. Installing a Swimming Pool or Spa? Important information that you must read before work commences. Installers - Have you Checked Our Load Calculator? The total load cannot be underestimated when installing a swimming pool or spa. 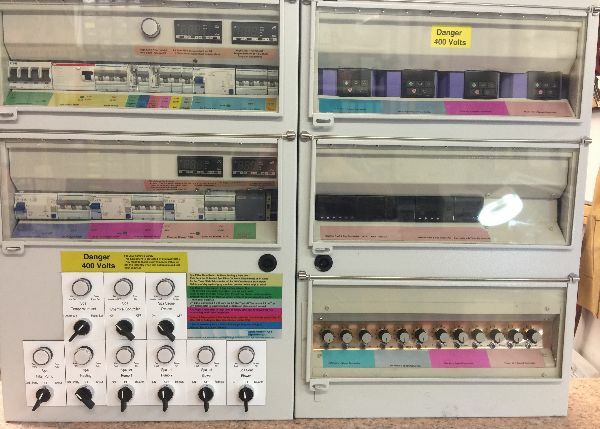 Need advice on replacement control panel parts? 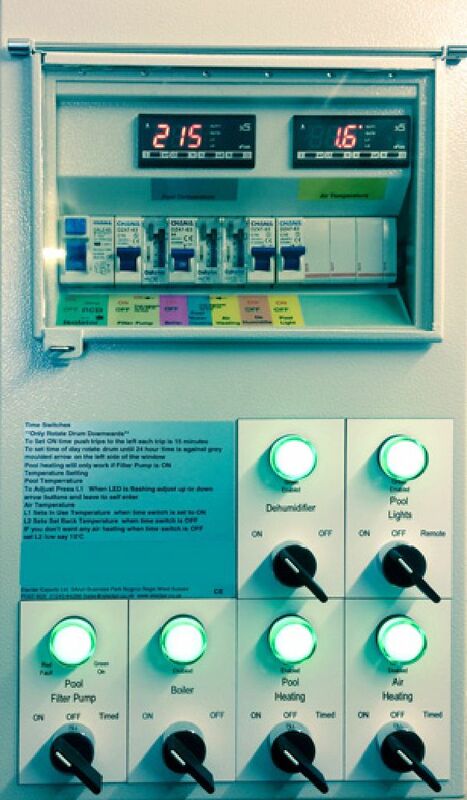 This is your go to guide for control panels. Control for swimming pool with inbuilt spa, balance tank, swim jet, large electric boost heater with proportional load shed with website providing monitoring system and remote control. 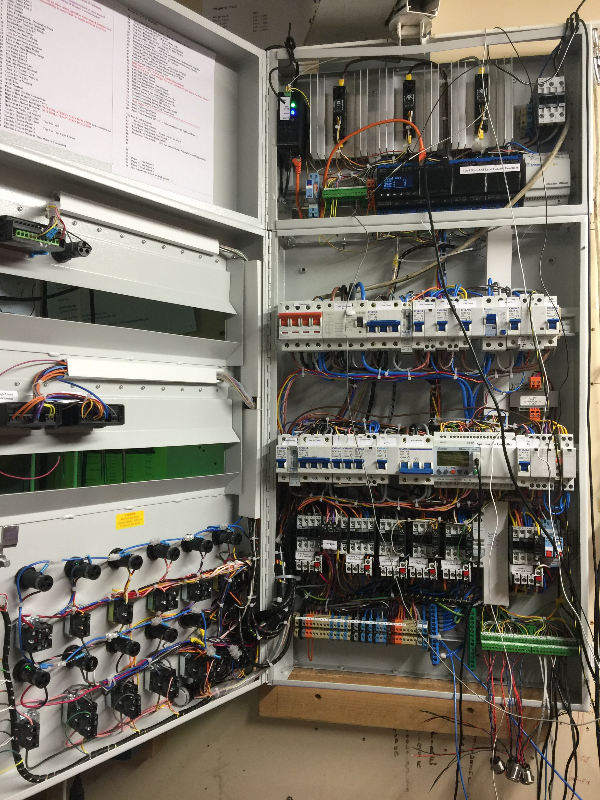 Interior of image 1, a control for swimming pool with inbuilt spa, balance tank, swim jet, large electric boost heater with proportional load shed with website providing monitoring system and remote control. 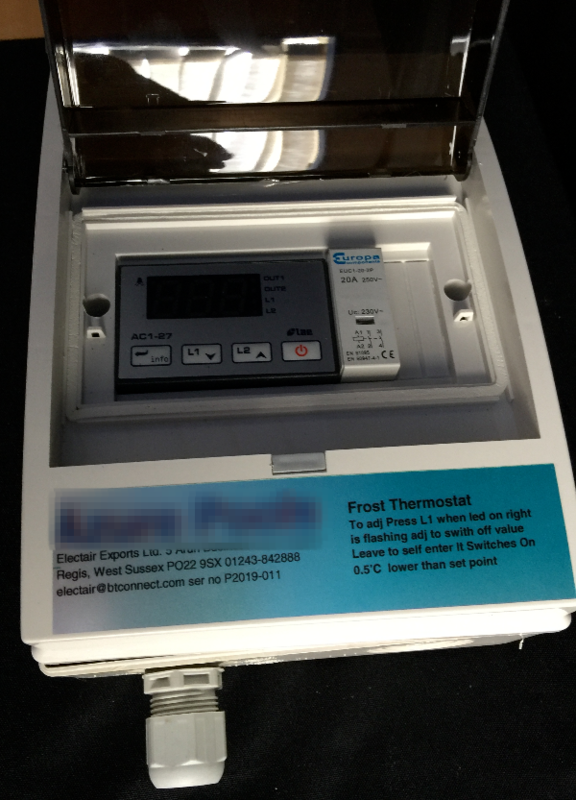 Individual add on frost thermostat. 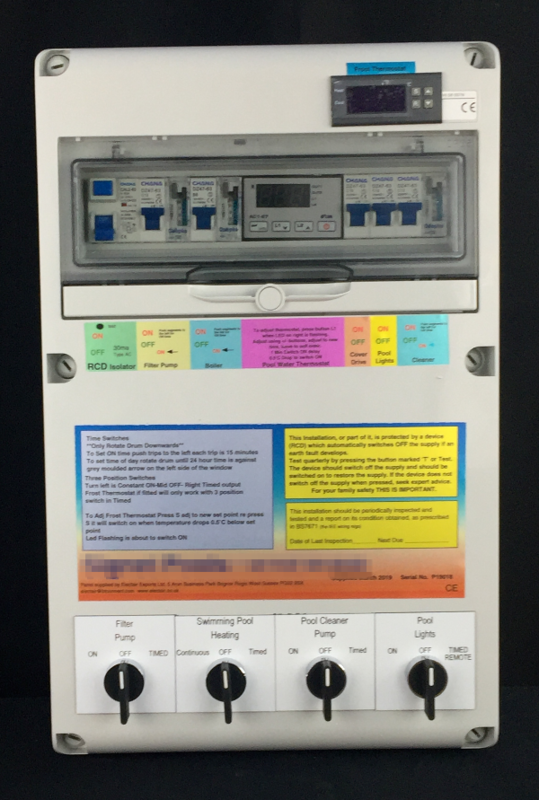 Typical garden pool control panel in a plastic enclosure. 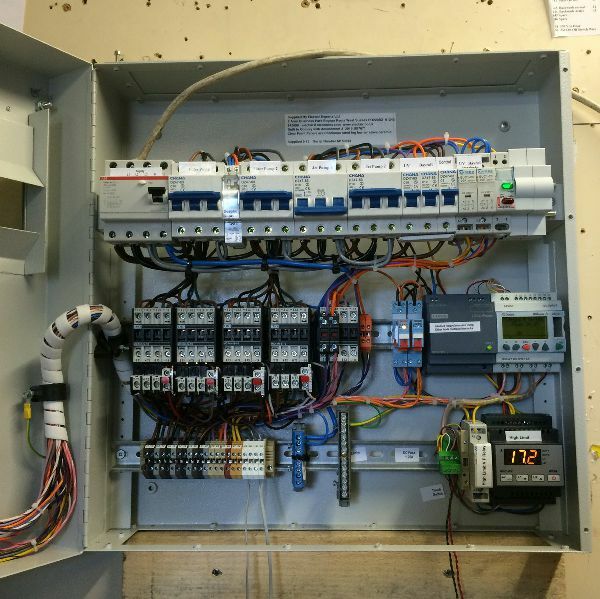 This is a 3 phase swimming pool control panel for a swimming pool with overflow to spa. 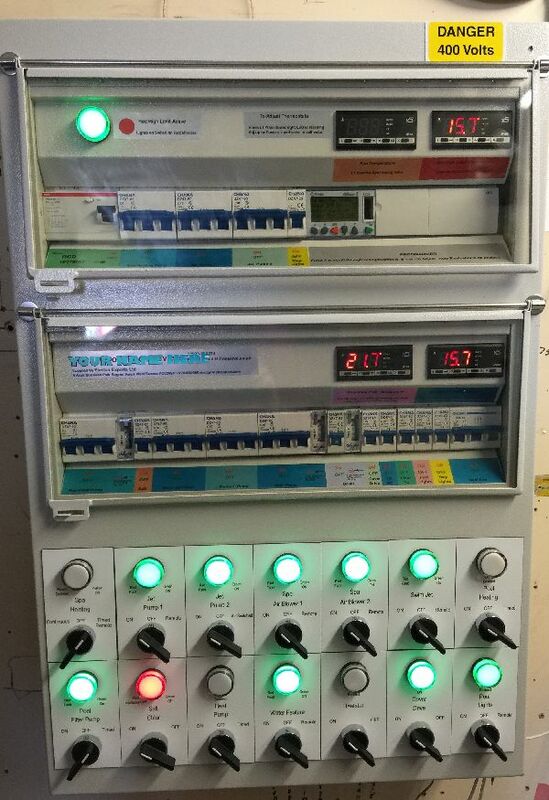 It includes a balance tank control and bottom right is a cellar flood alarm. 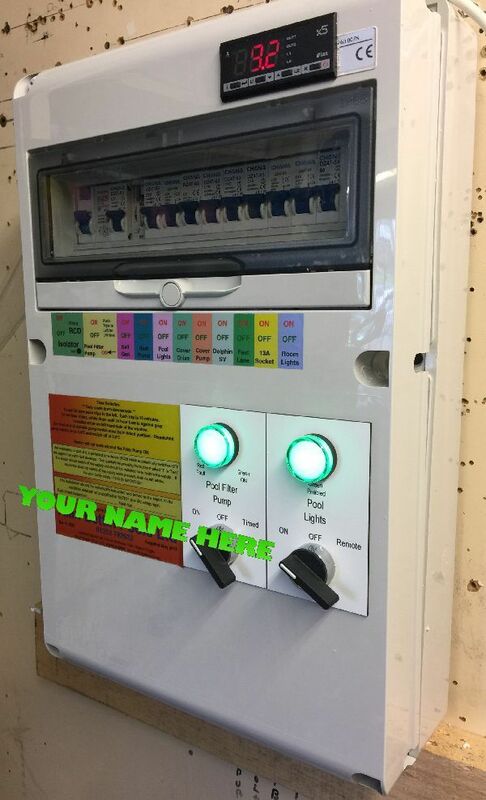 The two green indicators are the fire alarm link and safety emergency stop circuits. 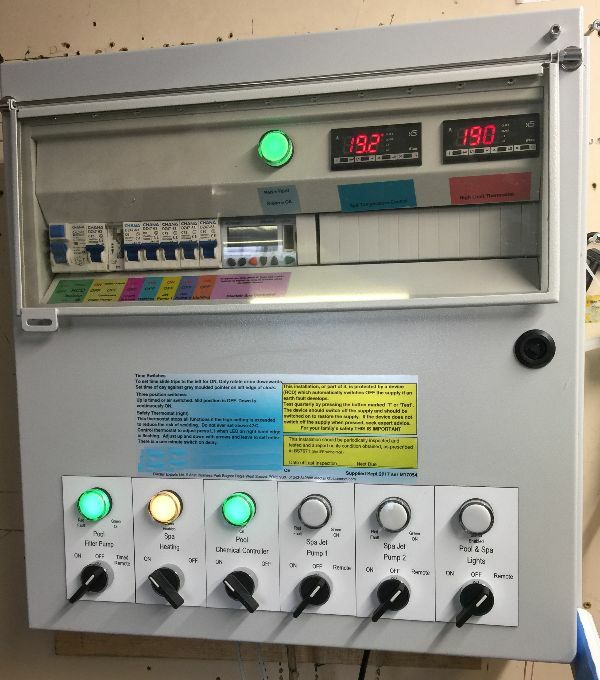 Digital pool temperature and digital time switches. 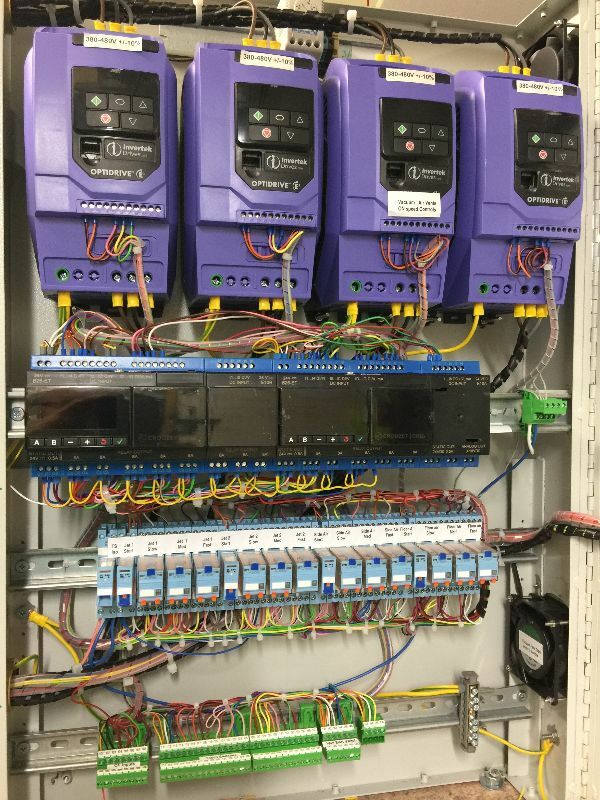 Built in an Amendment 3 compliant 50 module enclosure. 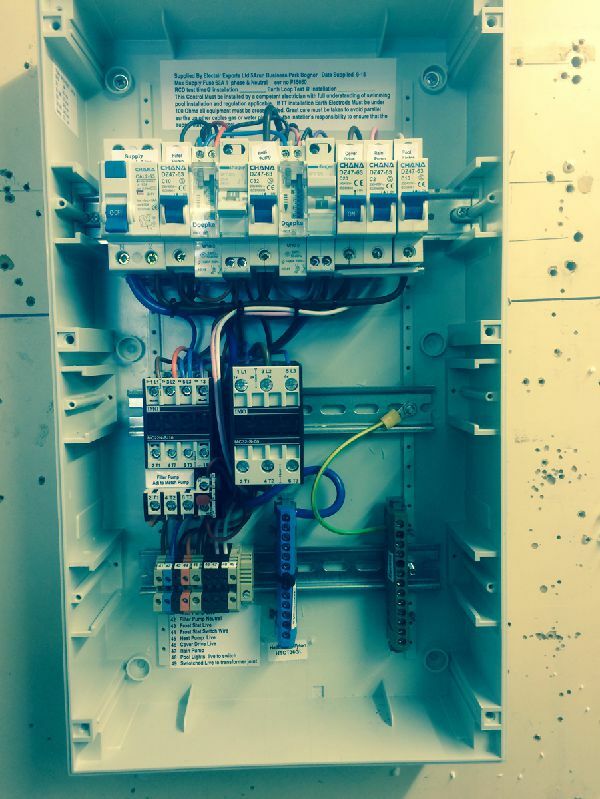 3 Phase electrical supply with single phase loads spread over the phases. 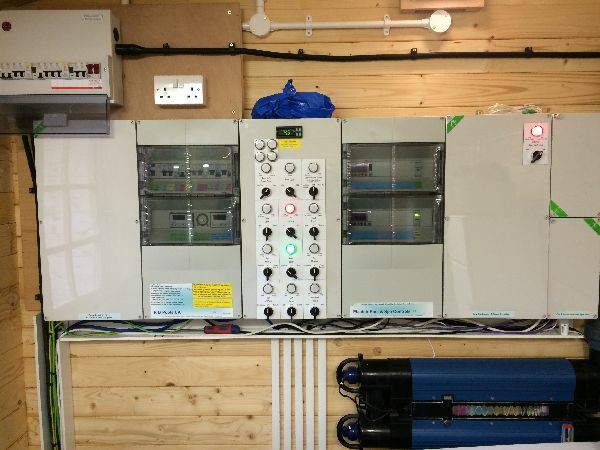 Built in an Amendment 3 compliant 13 module electrical swimming pool and spa enclosure. 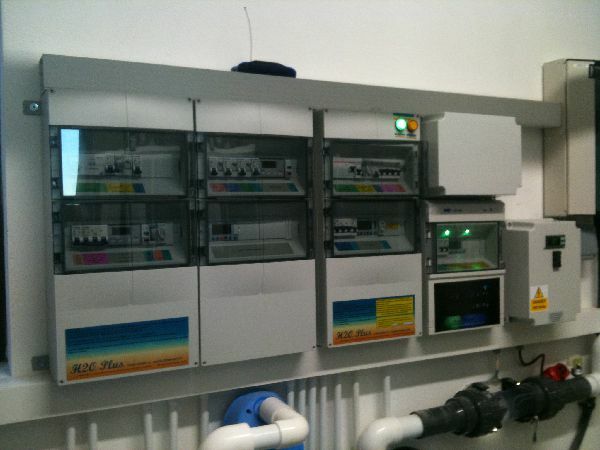 Single phase dual temperature swimming pool and spa control built in 26 module (2 x 13) Amendment 3 compliant enclosure. Conventional swimming pool control enclosure with Electair frame system. 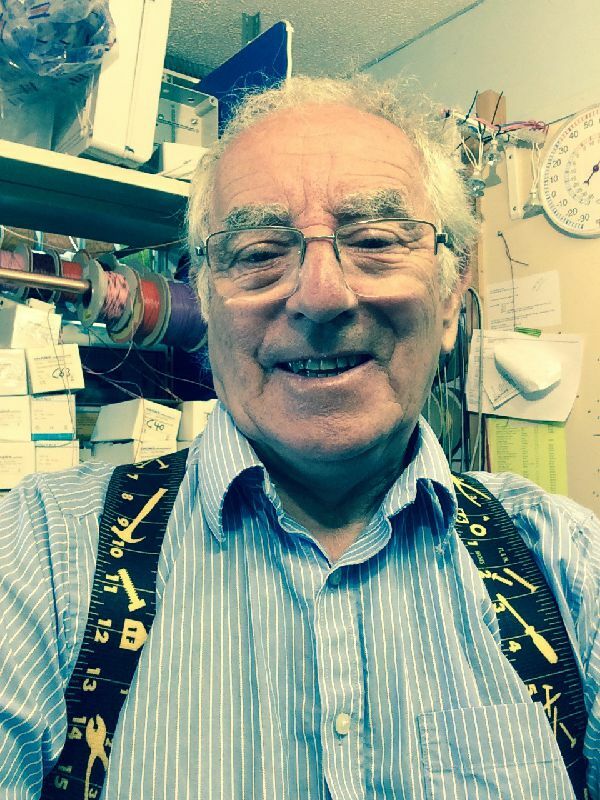 To support digital stats and access to RCD and time switches. 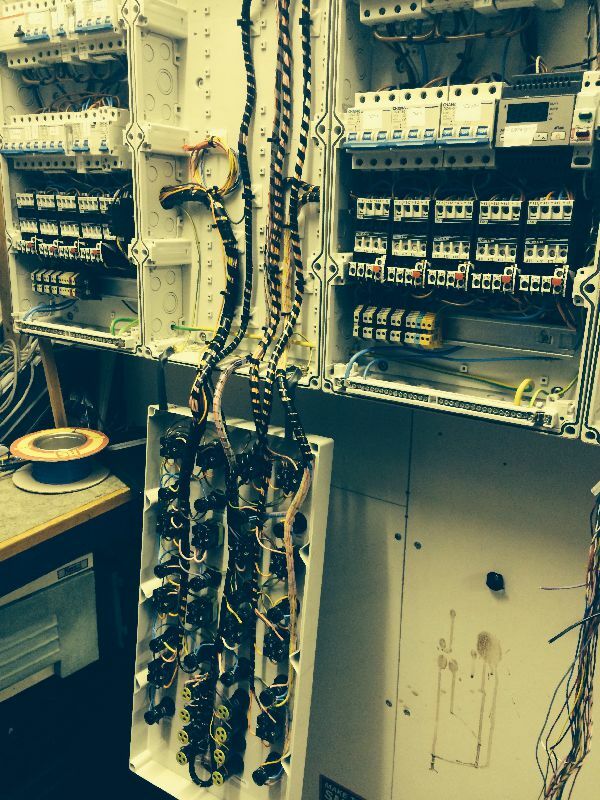 Larger garden swimming pool and spa control before going to site. 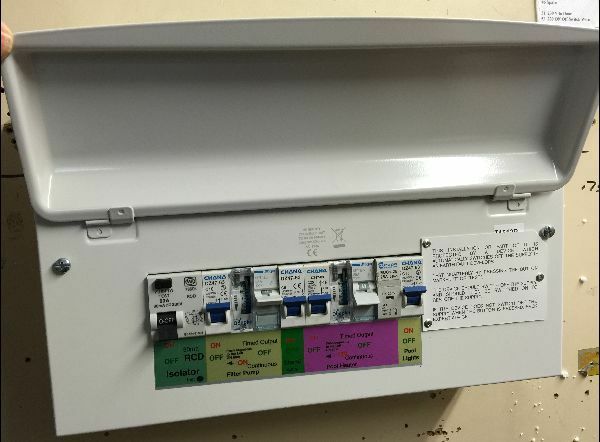 Single phase supply with digital temperature and frost protection thermostats. 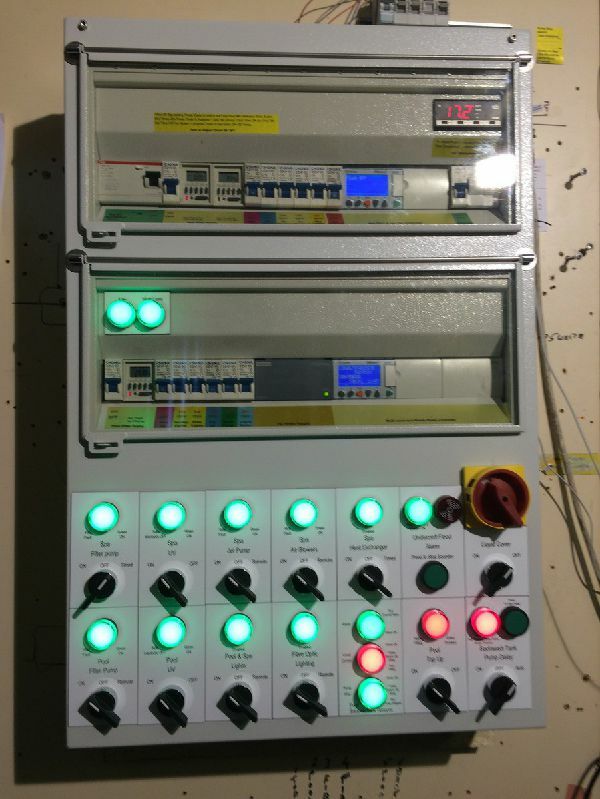 Built in an Amendment 3 compliant 13 module enclosure. Can have up to eight front mounted switches in this size enclosure. 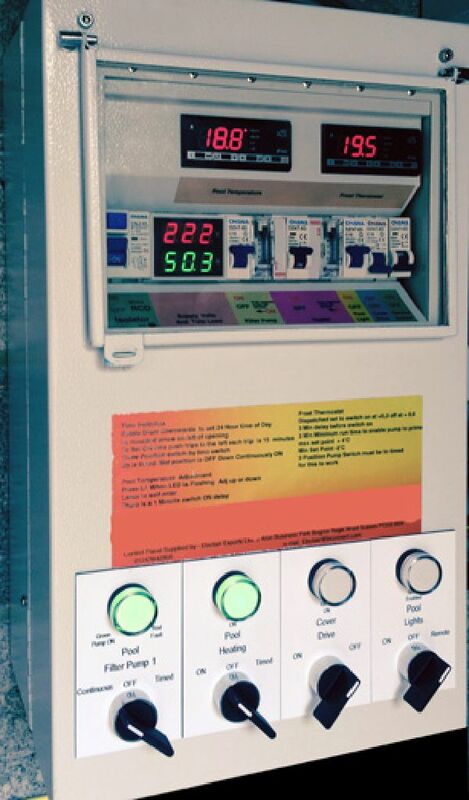 Single phase supply with digital temperature and frost protection thermostats. Supply voltage and total load amps meter fitted. 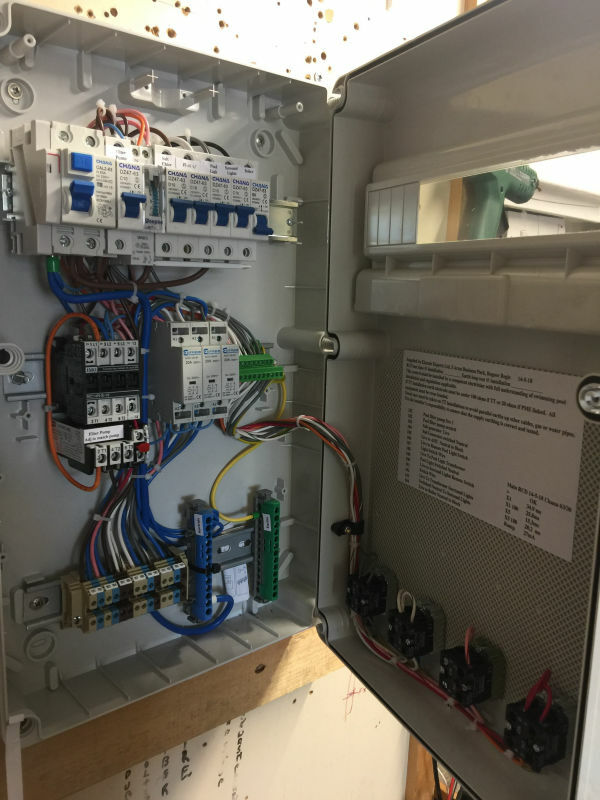 Built in an Amendment 3 compliant 13 module electrical enclosure. 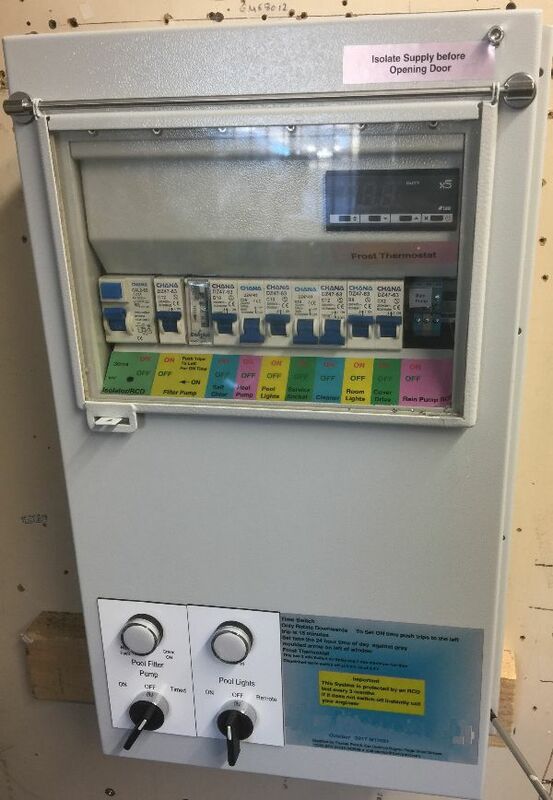 Single phase pool control in plastic enclosure with swimming pool temperature thermostat and volts and load monitoring. 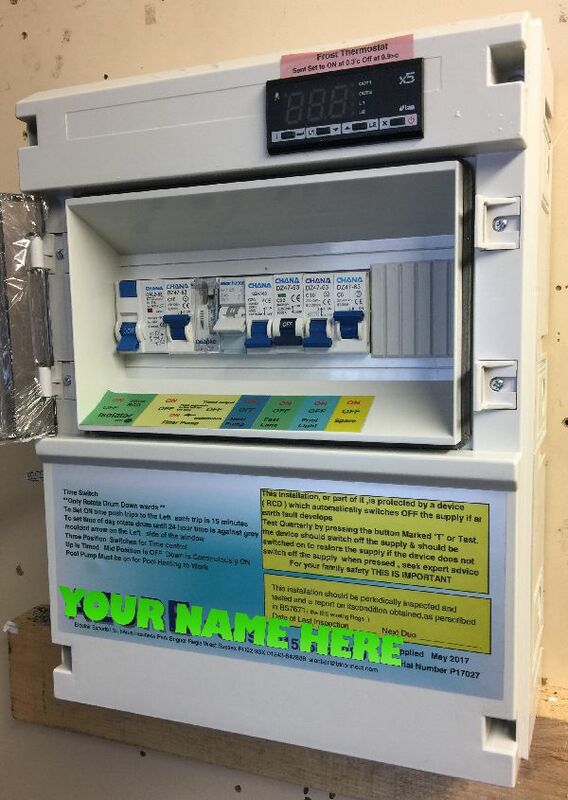 Metal electrical enclosure for single phase pool control with flood sensor and digital frost thermostat, built in an Amendment 3 compliant 13 module metal enclosure. Single phase electrical control enclosure in plastic 20 module enclosure with frost and swimming pool temperature control. Reduced cost version swimming pool and spa enclosure without indicator lights. Lower cost plastic swimming pool and spa control enclosure, 12 module with digital frost thermostat. 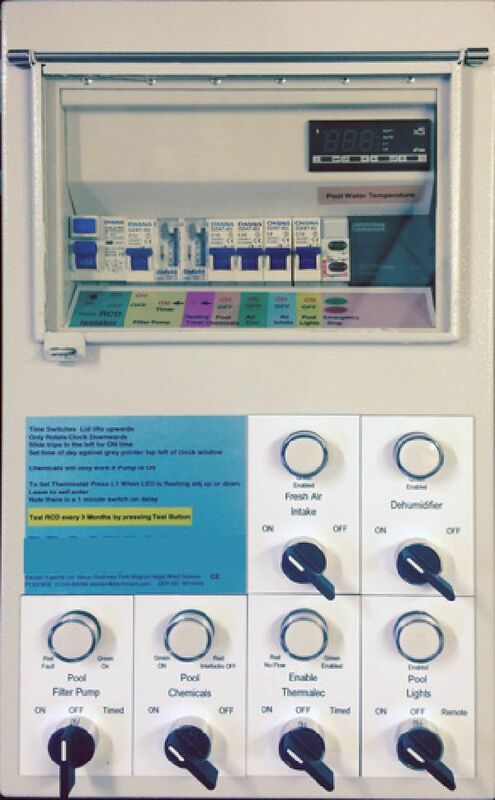 Garden swimming pool control panel in 20 module enclosure. 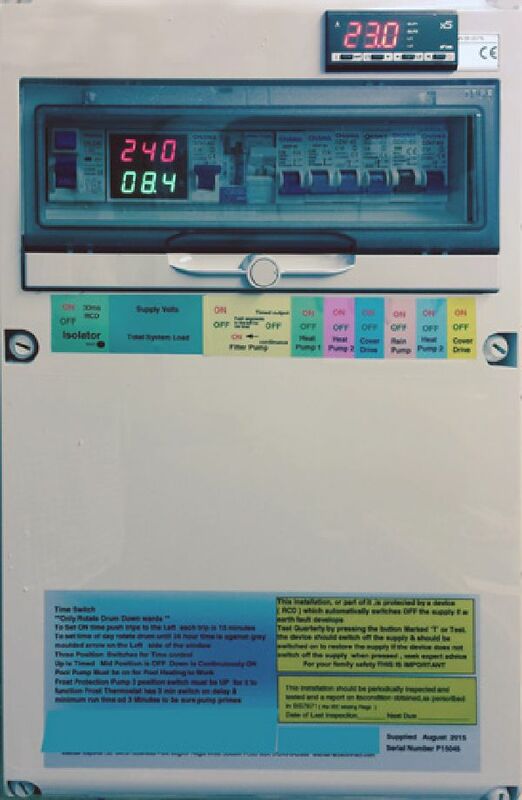 Commercial spa control panel with thermostat, timed functions and high limit blockout. 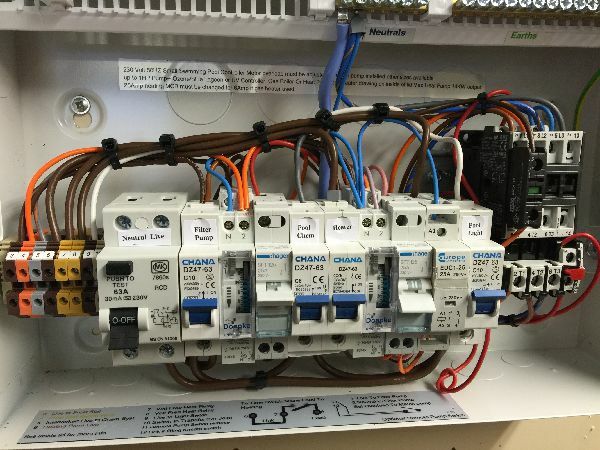 Low cost Amendment 3 compliant panel. Only suitable for small swimming pools. Lid open view of swimming pool control panel shown in image 14. 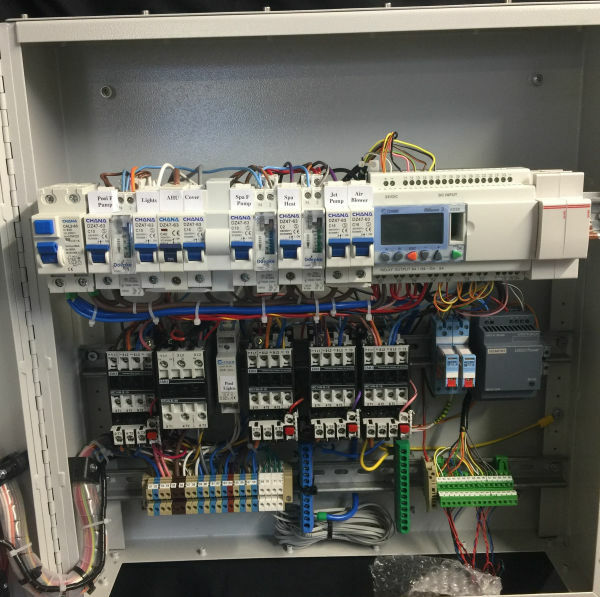 Lower cost metal control panel enclosure maxed out with components, only space for one contactor. 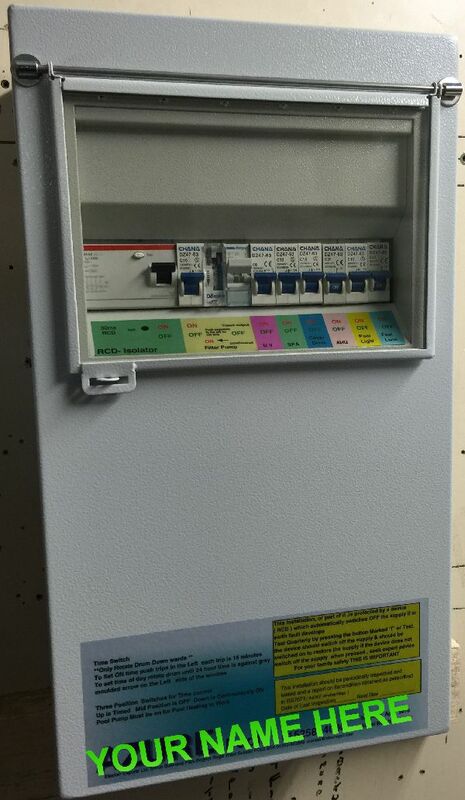 Typical inside of smaller swimming pool and spa control metal enclosure. 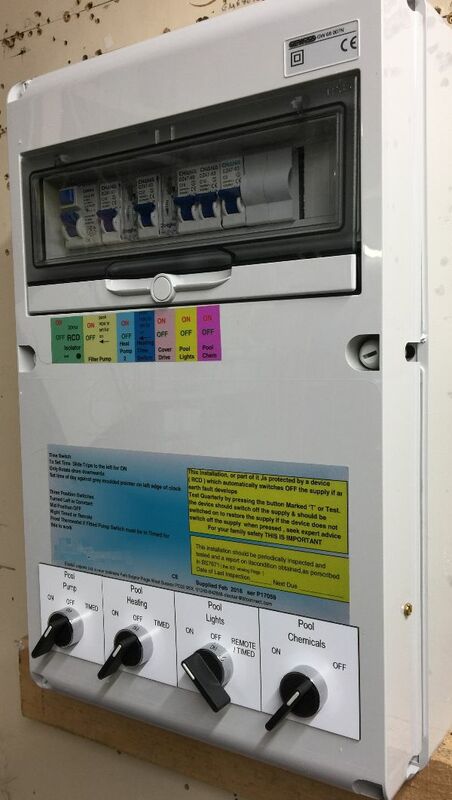 Typical inside of smaller plastic control panel enclosure. Typical inside of 20 module plastic swimming pool and spa control enclosure. 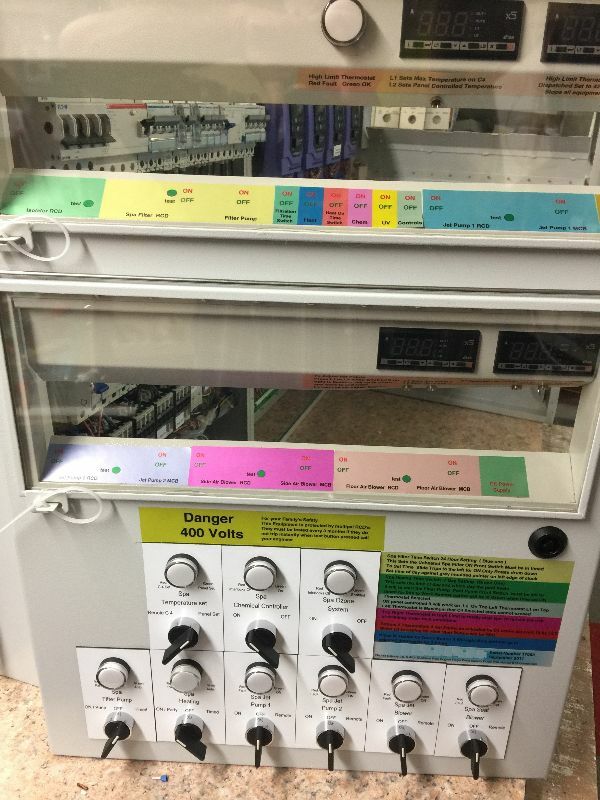 Typical inside of 25 module control panel enclosure. All systems built to your requirements. 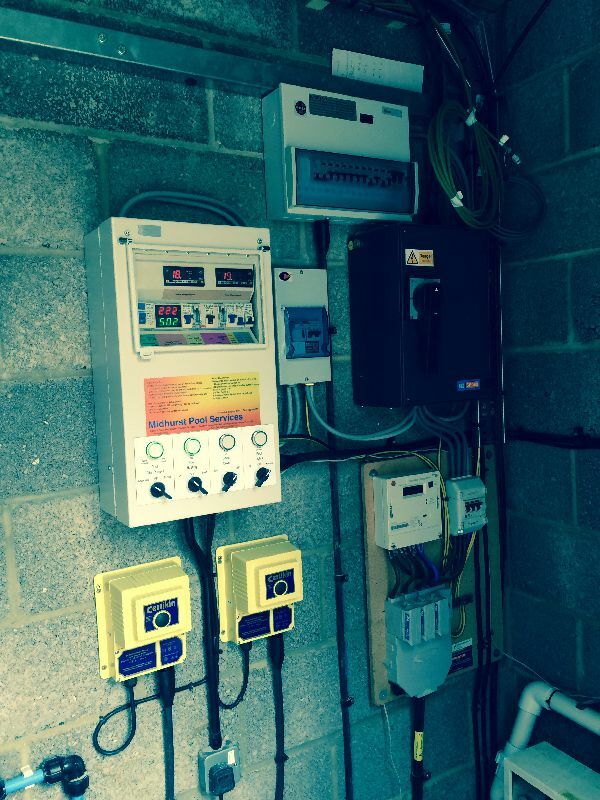 Garden swimming pool control panel installed with other electrical equipment. Very large garden swimming pool and overflow spa installation with remote controlled variable speed pumps. Large plastic swimming pool and spa control panel during installation. 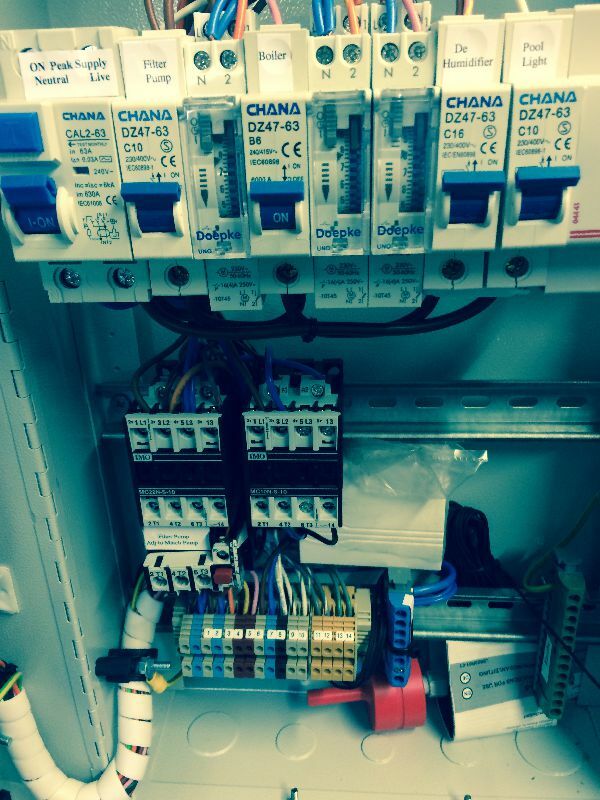 Another swimming pool and spa control panel installation. Just ring with your swimming pool and spa control panel needs! 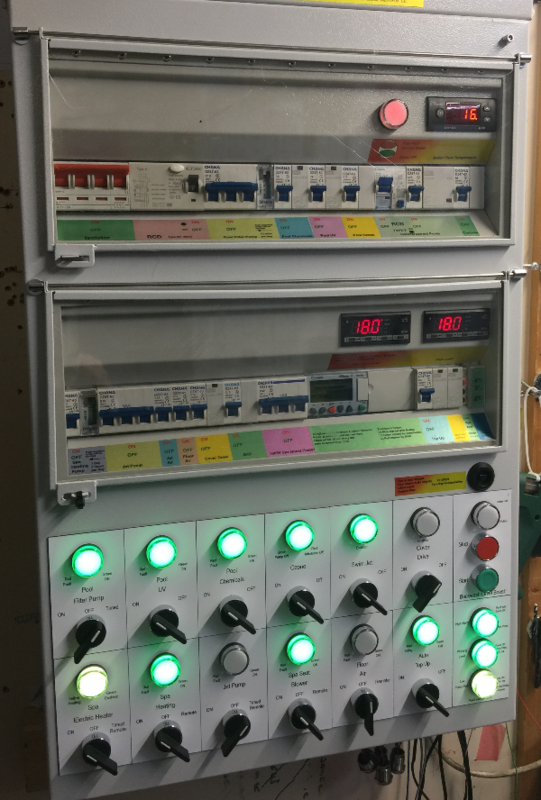 Major project control panel with four speed control systems, each with three pot adjustable settings. Multi zone temperature control as requested. 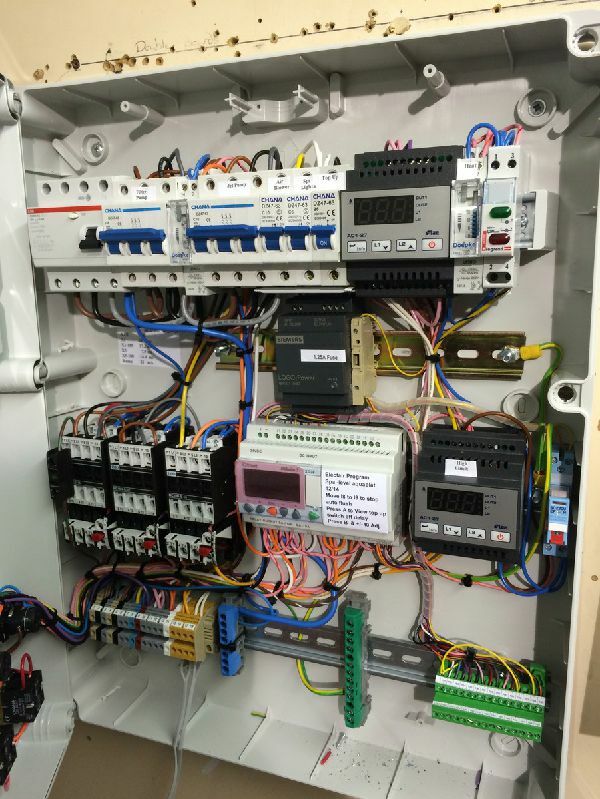 Right hand side of swimming pool control panel shown in image 26 showing internal workings with two Crouzet M4 PLCs controlling functions. Right hand side door of control panel shown in image 26, partly open showing adjustable set points. Single window indoor swimming pool control with pool water temperature. This could be similar layout where thermostat is used for frost protection. Up to two thermostats can be fitted in this size box. 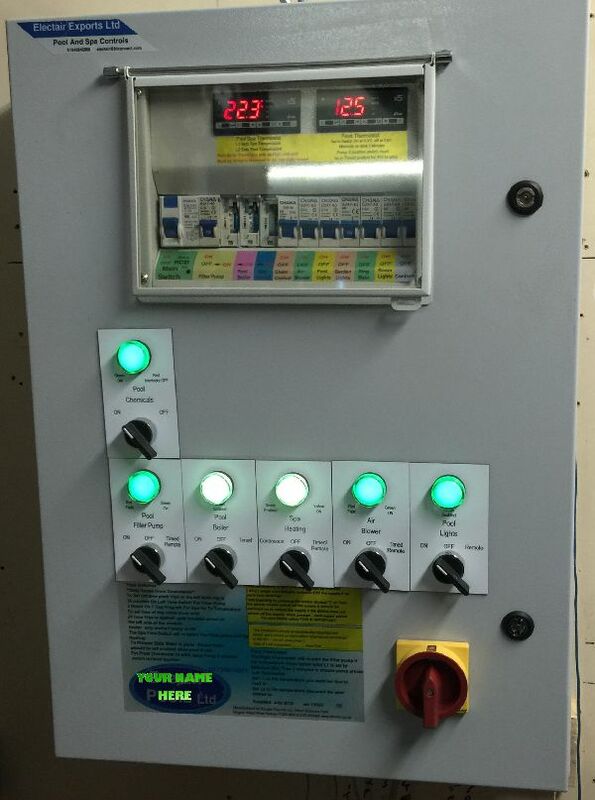 Combined swimming pool and spa control panel for use inside a building to comply with Amendment 3. 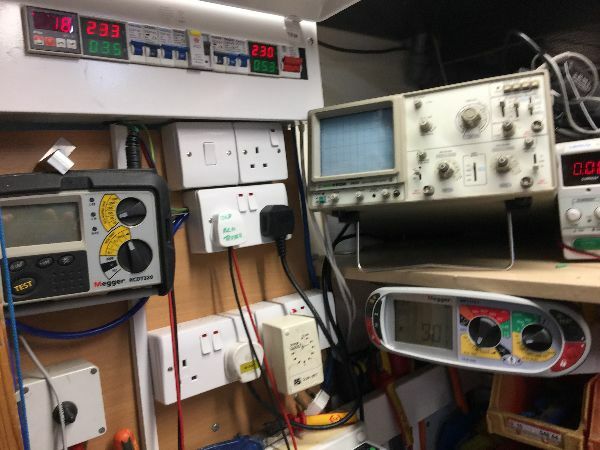 Inside view of the control panel shown in image 31. 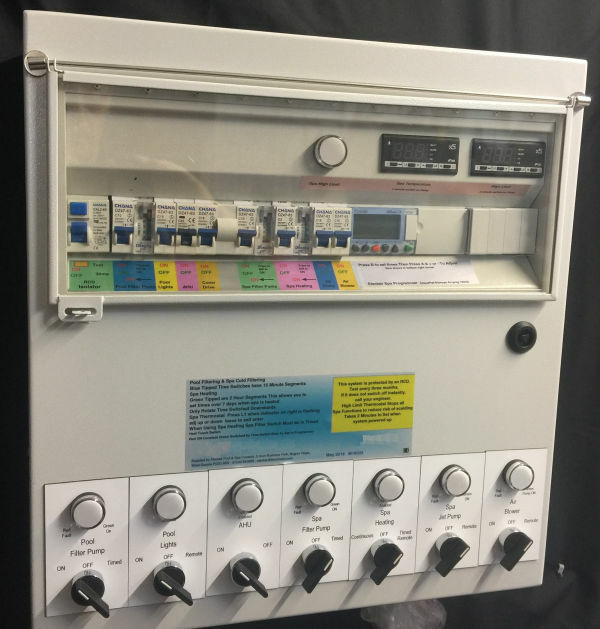 14 module conrol panel enclosure with rotary switches for use in outbuilding. Inside view of the control panel shown in image 33. 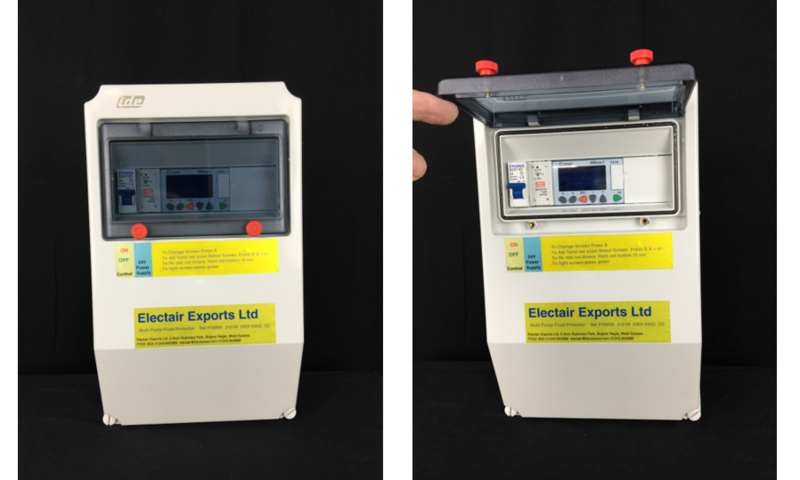 13 module control panel enclosure suitable for use inside main property. Can have up to two rows of four switches, whatever is required. 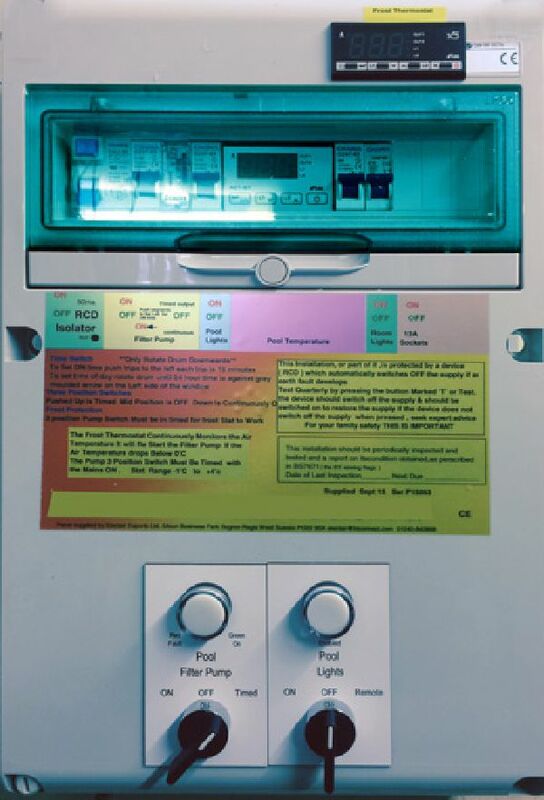 Front cover of heat pump add on box to meet 17th Edition Regulations, internal picture as per image 37. 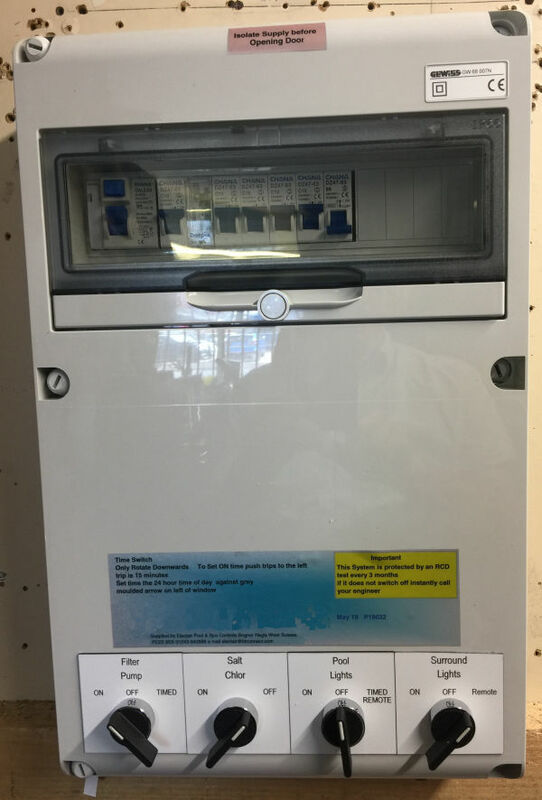 Heat pump add on box to meet 17th Edition Regulations. Order your electrical enclosures online, designed for easy build with a range of accessories to customise your requirements. 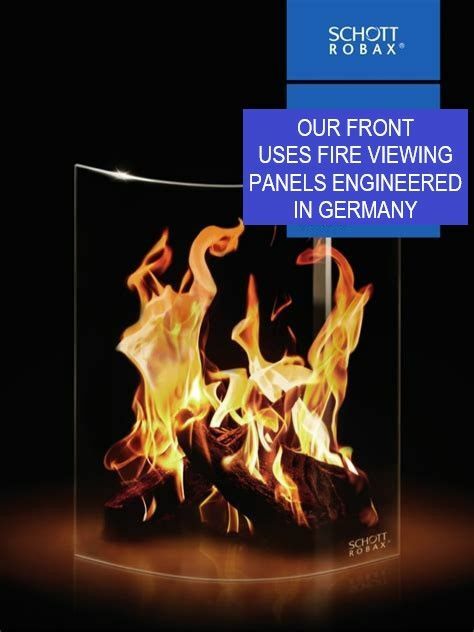 Our panels use fire rated viewing panels. 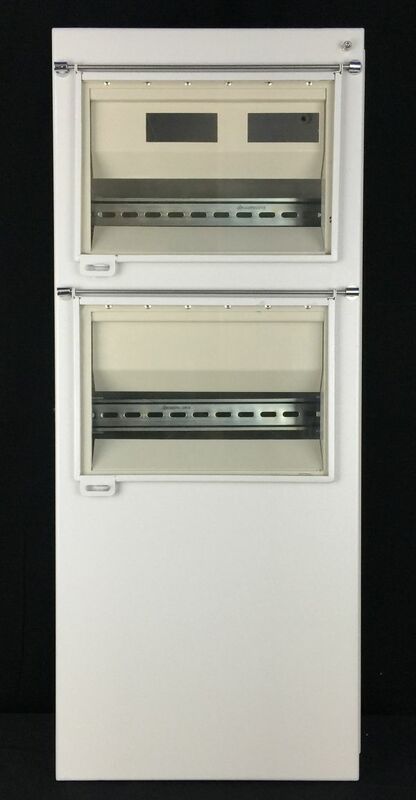 This control has two temperature sensors, one to monitor the air and an optional second one to monitor the water temperature. 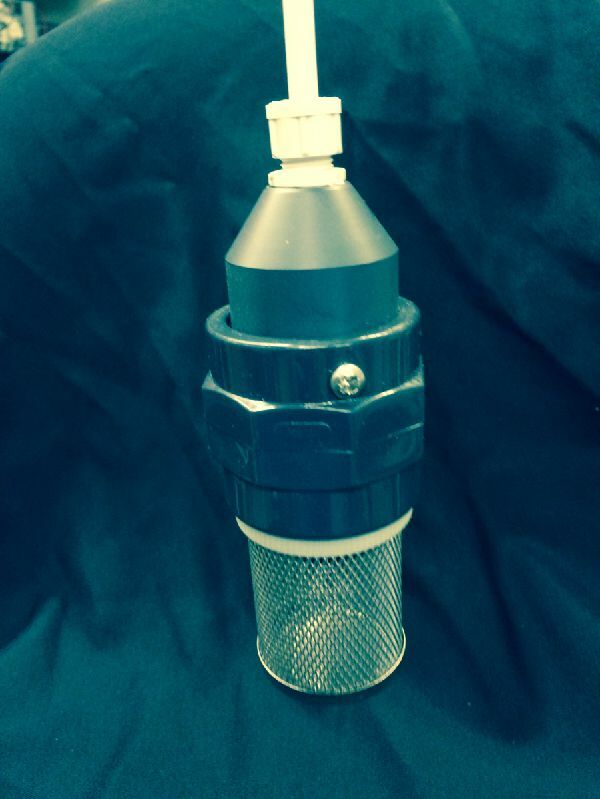 The filter pump can be set for continuously on during a frost situation. The heater can be set to come on at a lower temperature if the site requires. When the air teperature rises, it will switch off both water and air heating. Other pumps and blowers are sequenced switched on for three minutes and off for 30 minutes to conserve energy. The filter pump, providing there is no heating, can also be sequenced switched. 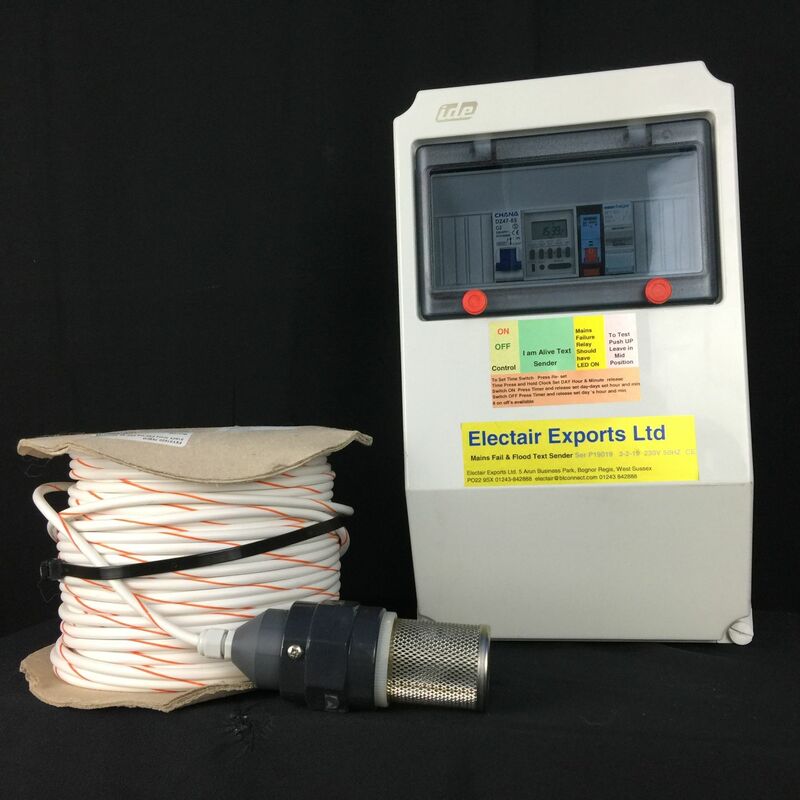 These times can be adjusted at the time of manufacture to your requirements The set temperature and the now temperature are displayed on the screen and the set points are adjustable. Many times a year we hear of expensive equipment that has been damaged due to mains failure of a surface water pump. 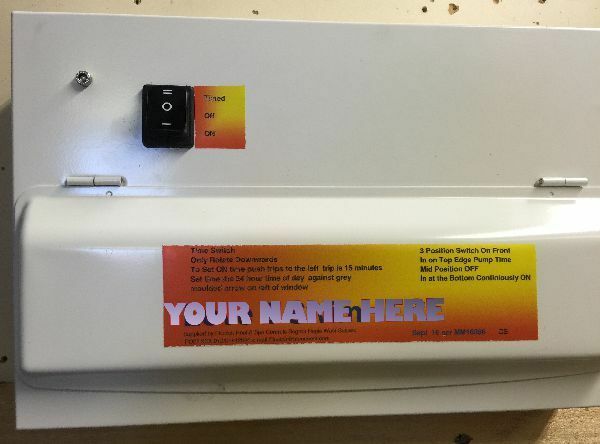 This device has a battery powered SMS sender alert that will advise you of mains failure or high water level.. 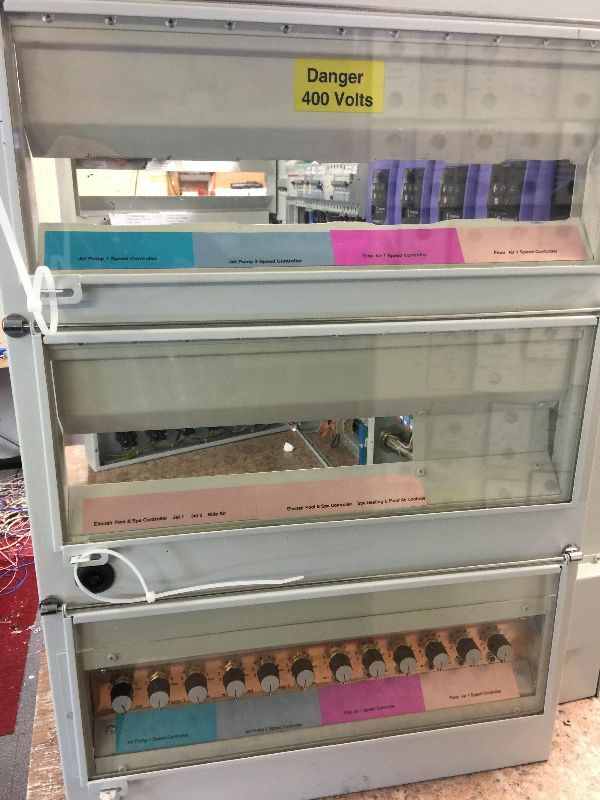 Originally designed for swimming pool balance tanks, Electair Float Switches are now suitable for multiple applications. 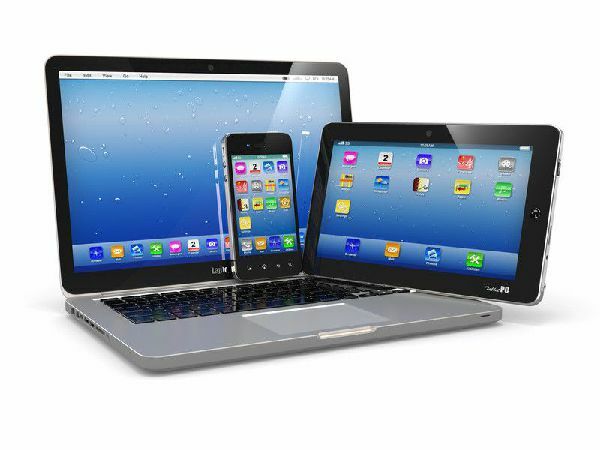 Remote control heating, lighting and so much more from your mobile phone, tablet and desktop computer. 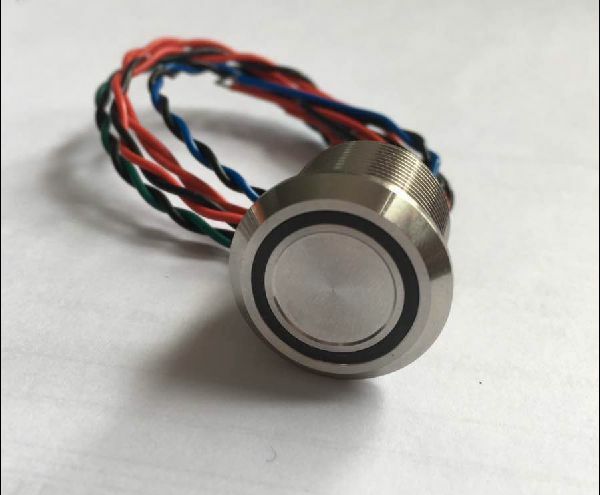 Range of touch switches for many applications. 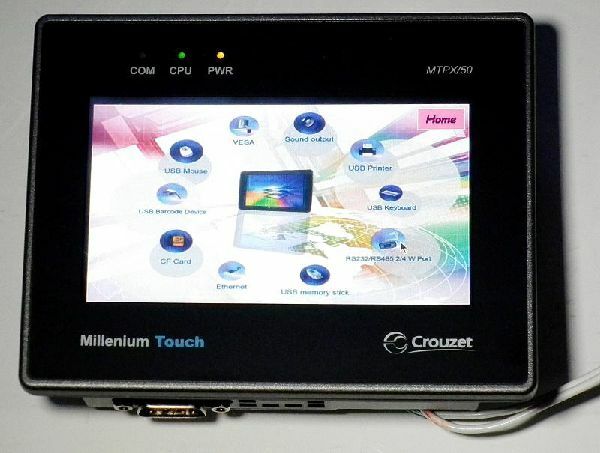 TFT LCD touch screen HMI programmable terminal. Electair's answer to Amendment 3.